SINGAPORE - To be perceived as an ideal employer, a company needs to be more than just a good paymaster. Having the "cool" factor of offering employees overseas postings and a creative working environment goes a long way too. 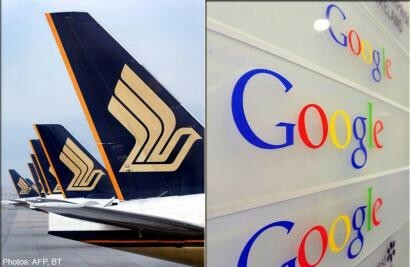 Google and Singapore Airlines are two keen examples of this, going by a survey from employer branding firm Universum. Google was ranked unanimously as the employer of choice by university undergraduates in business, IT, humanities and law courses, and it was also placed second by engineering undergrads. SIA took top spot for engineering students and it was also placed second and third by business and humanities undergrads respectively. The top companies were strongly associated with having the right people, culture and work environments. The study surveyed 7,294 undergrads between October last year and January. Respondents felt that Google possessed attributes of a creative, dynamic and friendly work environment, and the firm had respect for its people. At the same time, they also perceived the company as having inspiring management and flexible working conditions, and enabling employees to integrate personal interests into their schedules. For SIA, the opportunity for international travel and relocation, as well as a prestige factor, were the carrier's strongest attributes, said respondents. Among the qualities most valued in top employers, "friendly work environment" headed the list. In second place was "professional training and development" and third, "a creative and dynamic work environment". The attribute of "high future earnings" was ranked fourth in importance. Mr Joakim Strom, Universum's managing director for the Asia-Pacific, said salary is becoming more of a "hygiene factor": something which may not make employees feel satisfied, but it will make them feel unhappy if it is not provided. He noted that as work and personal life continue to merge, there is a "growing desire" to find meaning in life through careers. Mr Mark Hall, vice-president and country manager of Kelly Services, said employees "value meaningful engagement" more than ever, and their survey of Gen Y respondents showed that personal fulfilment and personal growth were placed above salary. Mr Tong Hon Yee, 22, an economics undergraduate at Singapore Management University, said his ideal employer would be one whose vision he identifies with. "For instance, I wouldn't work for a tobacco company. I would want to know that I'm contributing meaningfully to making people better off," said Mr Tong.